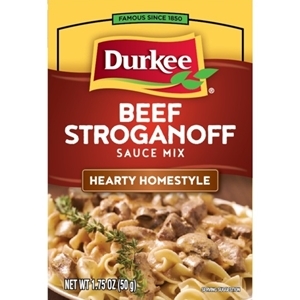 Durkee Beef Stroganoff Seasoning Mix is a convenient and quick way to prepare an authentic-tasting beef stroganoff. This classic dish is sure to satisfy. 1.25 ounce packet. 1. Brown beef in a large skillet until cooked. 2. Stir Durkee Stroganoff sauce mix, water, and sour cream into meat. 3. Bring to boil; stirring constantly. Reduce heat; simmer, stirring 1 minute or until thickened. 3. Serve over noodles or rice, if desired. Wheat Flour, Modified Food Starch, Whey, Hydrolyzed Soy Protein, Dried Onion, Nonfat Milk Powder, Buttermilk Powder, Salt, Dried Mushrooms, Dried Garlic, Spice, Caramel Color, Hydrolyzed Soy, Corn and Wheat Protein, Beef (Broth and Fat), Mushroom Powder, Silicon Dioxide (to Prevent Caking), Disodium Inosinate and Guanylate, Spice Extractive.